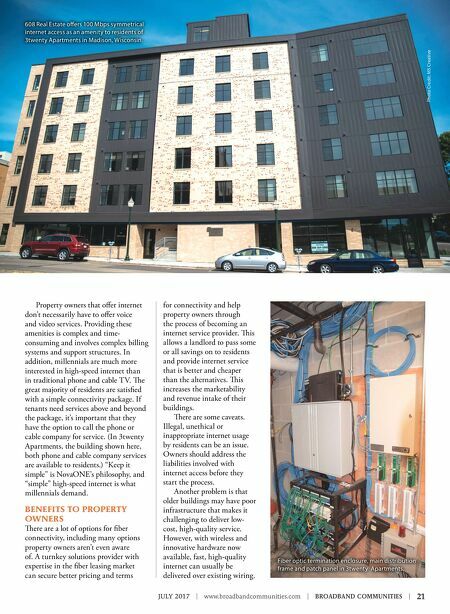 20 | BROADBAND COMMUNITIES | www.broadbandcommunities.com | JULY 2017 MDU STRATEGIES Being fiber connected is a valuable marketing tool that can make an apartment building stand out. 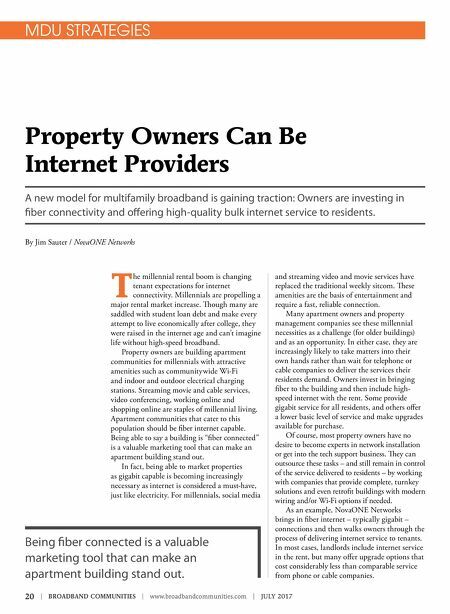 Property Owners Can Be Internet Providers A new model for multifamily broadband is gaining traction: Owners are investing in fiber connectivity and offering high-quality bulk internet service to residents. By Jim Sauter / NovaONE Networks T he millennial rental boom is changing tenant expectations for internet connectivity. Millennials are propelling a major rental market increase. ough many are saddled with student loan debt and make every attempt to live economically after college, they were raised in the internet age and can't imagine life without high-speed broadband. Property owners are building apartment communities for millennials with attractive amenities such as communitywide Wi-Fi and indoor and outdoor electrical charging stations. Streaming movie and cable services, video conferencing, working online and shopping online are staples of millennial living. Apartment communities that cater to this population should be fiber internet capable. Being able to say a building is "fiber connected" is a valuable marketing tool that can make an apartment building stand out. In fact, being able to market properties as gigabit capable is becoming increasingly necessary as internet is considered a must-have, just like electricity. For millennials, social media and streaming video and movie services have replaced the traditional weekly sitcom. ese amenities are the basis of entertainment and require a fast, reliable connection. Many apartment owners and property management companies see these millennial necessities as a challenge (for older buildings) and as an opportunity. In either case, they are increasingly likely to take matters into their own hands rather than wait for telephone or cable companies to deliver the services their residents demand. Owners invest in bringing fiber to the building and then include high- speed internet with the rent. Some provide gigabit service for all residents, and others offer a lower basic level of service and make upgrades available for purchase. Of course, most property owners have no desire to become experts in network installation or get into the tech support business. ey can outsource these tasks – and still remain in control of the service delivered to residents – by working with companies that provide complete, turnkey solutions and even retrofit buildings with modern wiring and/or Wi-Fi options if needed. As an example, NovaONE Networks brings in fiber internet – typically gigabit – connections and then walks owners through the process of delivering internet service to tenants. In most cases, landlords include internet service in the rent, but many offer upgrade options that cost considerably less than comparable service from phone or cable companies.